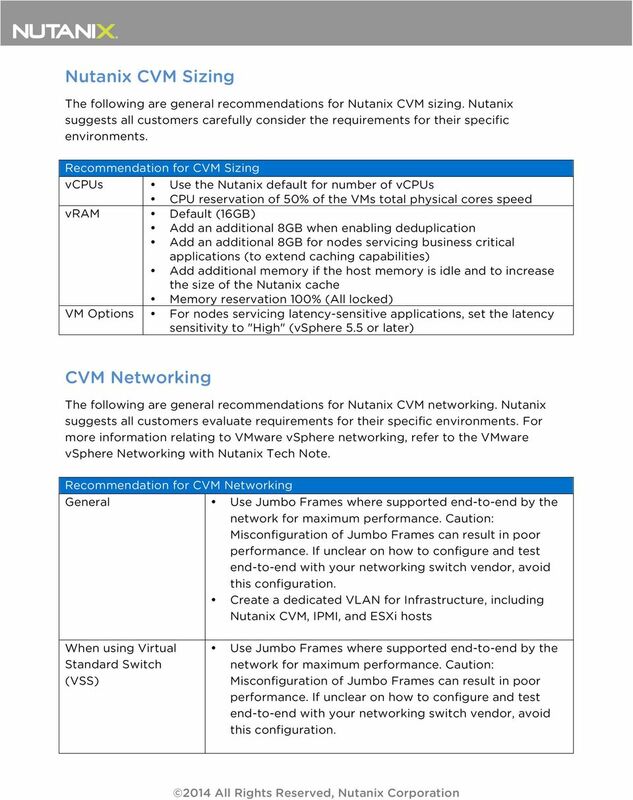 Download "Nutanix Tech Note. 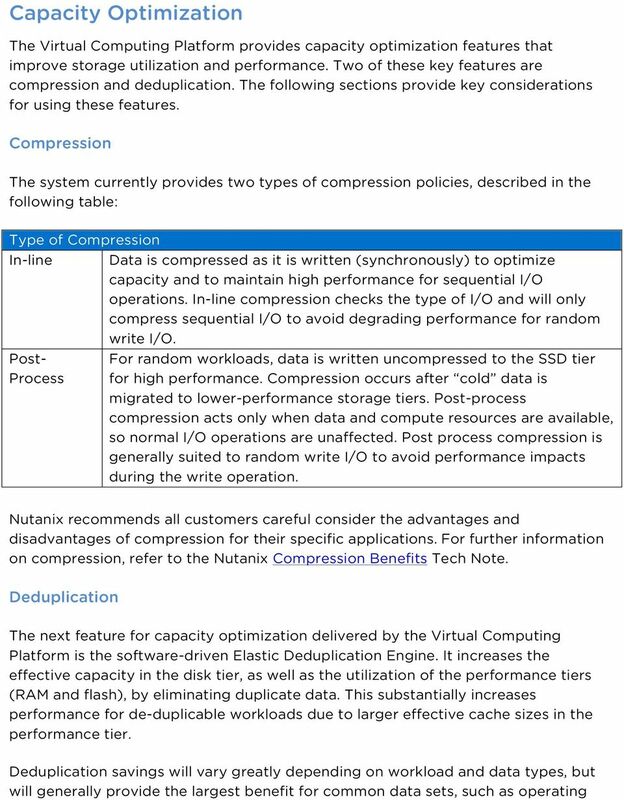 Configuration Best Practices for Nutanix Storage with VMware vsphere"
1 Nutanix Tech Note Configuration Best Practices for Nutanix Storage with VMware vsphere Nutanix Virtual Computing Platform is engineered from the ground up to provide enterprise-grade availability for critical virtual machines and data. 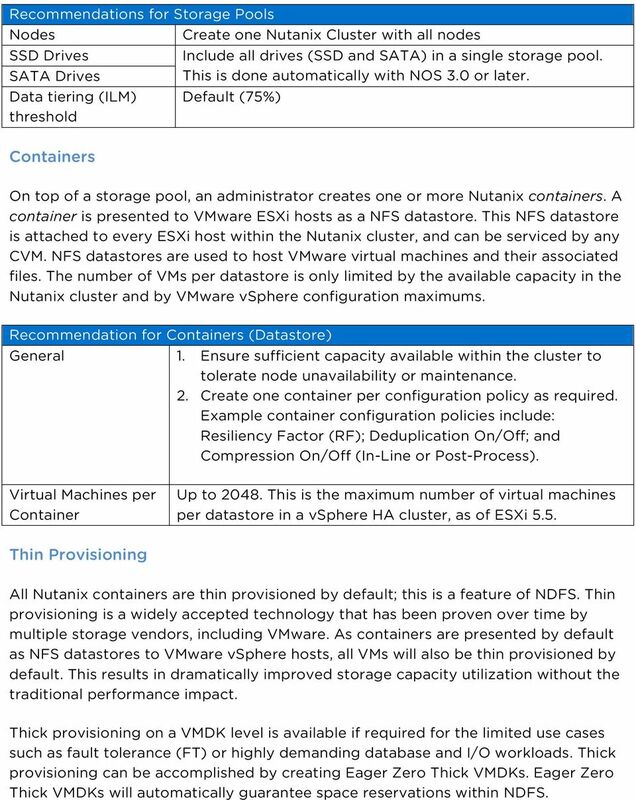 This Tech Note describes Nutanix storage concepts and how they should be configured in a VMware vsphere environment to ensure optimal performance and availability. 2 Table of Contents Executive Summary... 3 Nutanix Overview... 3 Storage Pools... 3 Containers... 4 Thin Provisioning... 4 Capacity Optimization... 6 Compression... 6 Deduplication... 6 NDFS Data Protection... 7 Nutanix CVM Sizing... 8 CVM Networking... 8 Multiple vsphere Clusters with Nutanix... 9 Handling Isolation Requirements Conclusion Further Reading Copyright 2014 Nutanix, Inc. Nutanix, Inc Technology Drive San Jose, CA All rights reserved. This product is protected by U.S. and international copyright and intellectual property laws. Nutanix is a trademark of Nutanix, Inc. in the United States and/or other jurisdictions. All other marks and names mentioned herein may be trademarks of their respective companies. 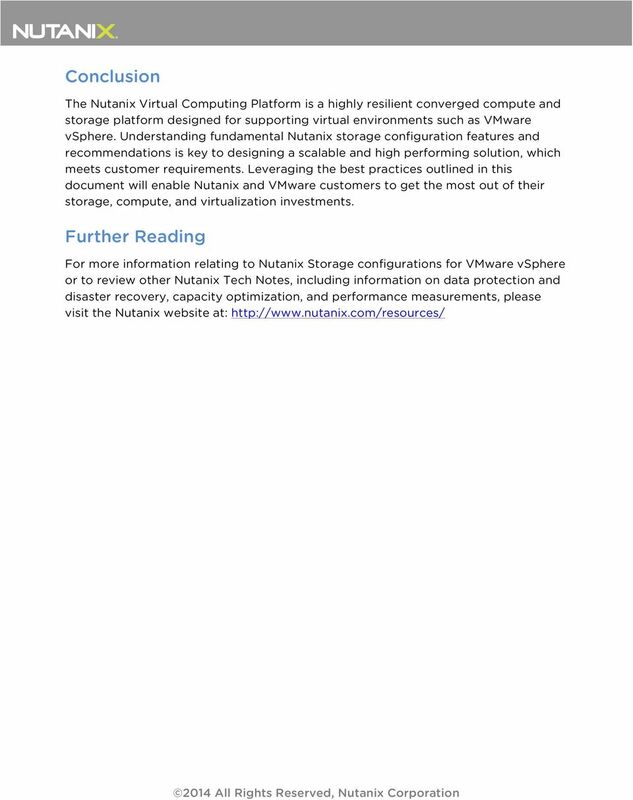 3 Executive Summary The Nutanix Virtual Computing Platform is a highly resilient converged compute and storage platform, designed for supporting virtual environments such as VMware vsphere. The Nutanix architecture runs a storage controller in a VM, called the Nutanix Controller VM (CVM). This VM is run on every Nutanix server node in a Nutanix cluster to form a highly distributed, shared-nothing converged infrastructure. All CVMs actively work together to aggregate storage resources into a single global pool that can be leveraged by user virtual machines running on the Nutanix server nodes. The storage resources are managed by the Nutanix Distributed File System (NDFS) to ensure that data and system integrity are preserved in the event of node, disk, application, or hypervisor software failure. NDFS also delivers data protection and high availability functionality that keeps critical data and VMs protected. Because of this highly distributed, shared-nothing architecture, the Virtual Computing Platform is not constrained by a limited number of storage controllers. This is a huge advantage compared to traditional shared storage platforms designed with two or four storage controllers. As a result, architecting and scaling a solution with Nutanix to service all datacenter requirements is much less complex. 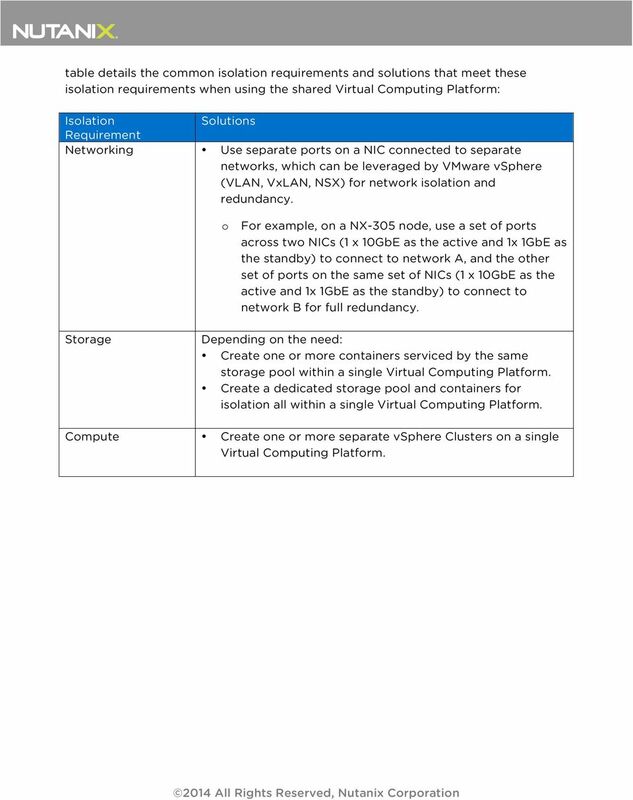 This document is intended to help the reader understand core storage configuration best practices for a Nutanix cluster running with VMware vsphere. 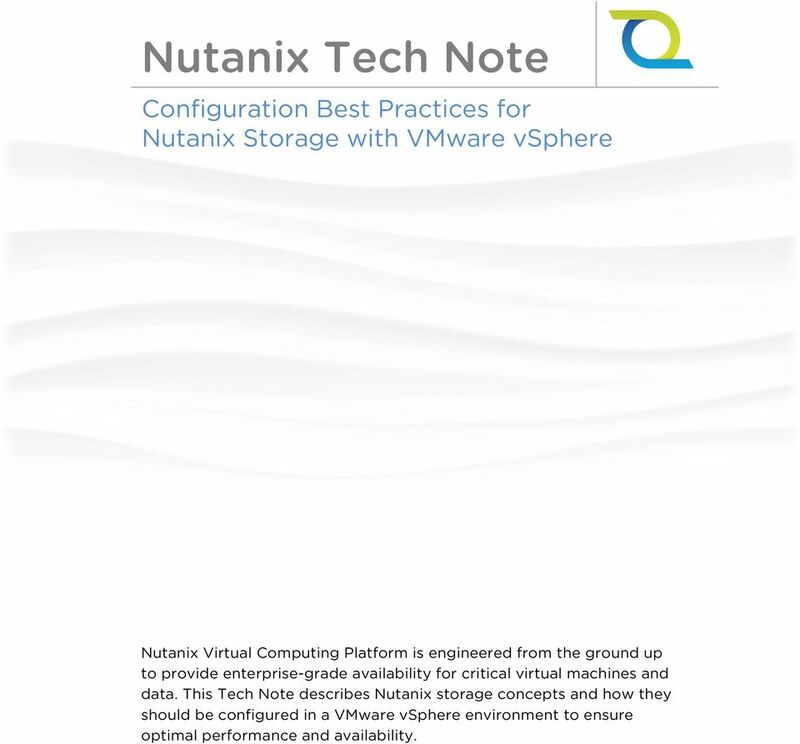 Implementing the following best practices will enable Nutanix customers to get the most out of their storage and virtualization investments. 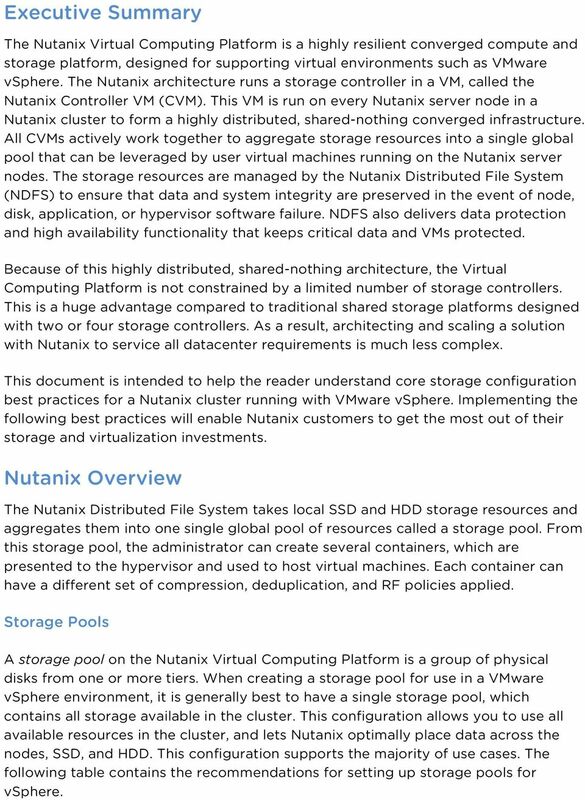 Nutanix Overview The Nutanix Distributed File System takes local SSD and HDD storage resources and aggregates them into one single global pool of resources called a storage pool. From this storage pool, the administrator can create several containers, which are presented to the hypervisor and used to host virtual machines. Each container can have a different set of compression, deduplication, and RF policies applied. Storage Pools A storage pool on the Nutanix Virtual Computing Platform is a group of physical disks from one or more tiers. When creating a storage pool for use in a VMware vsphere environment, it is generally best to have a single storage pool, which contains all storage available in the cluster. This configuration allows you to use all available resources in the cluster, and lets Nutanix optimally place data across the nodes, SSD, and HDD. This configuration supports the majority of use cases. 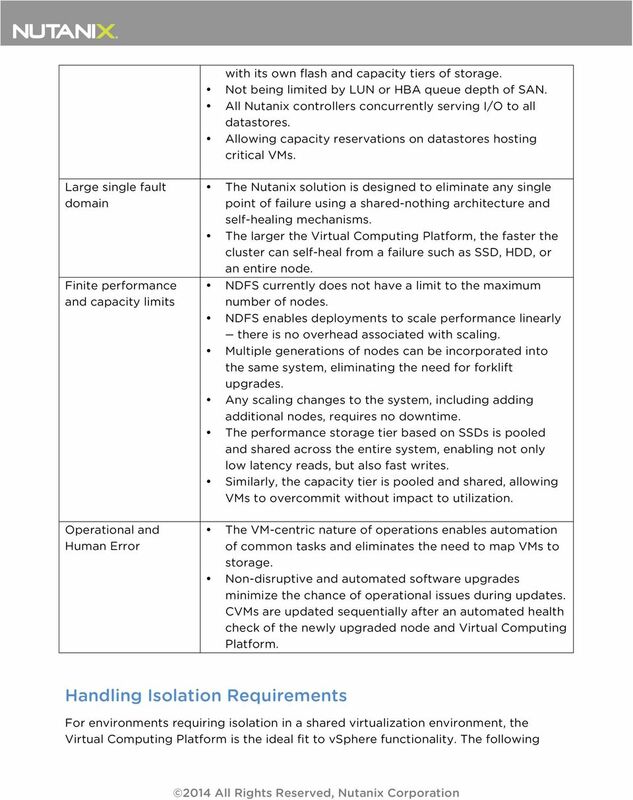 The following table contains the recommendations for setting up storage pools for vsphere. 4 Recommendations for Storage Pools Nodes Create one Nutanix Cluster with all nodes SSD Drives SATA Drives Data tiering (ILM) threshold Include all drives (SSD and SATA) in a single storage pool. This is done automatically with NOS 3.0 or later. Default (75%) Containers On top of a storage pool, an administrator creates one or more Nutanix containers. A container is presented to VMware ESXi hosts as a NFS datastore. This NFS datastore is attached to every ESXi host within the Nutanix cluster, and can be serviced by any CVM. NFS datastores are used to host VMware virtual machines and their associated files. 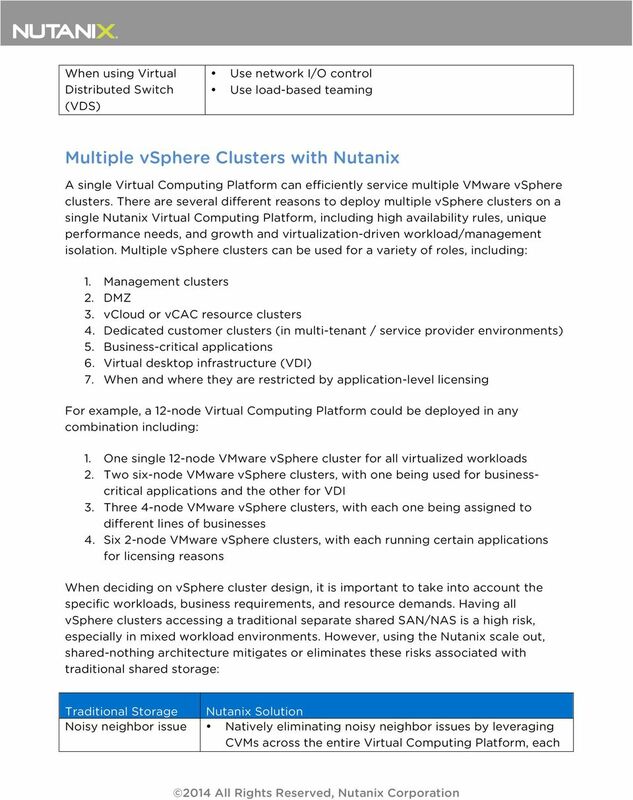 The number of VMs per datastore is only limited by the available capacity in the Nutanix cluster and by VMware vsphere configuration maximums. Recommendation for Containers (Datastore) General 1. Ensure sufficient capacity available within the cluster to tolerate node unavailability or maintenance. 2. Create one container per configuration policy as required. Example container configuration policies include: Resiliency Factor (RF); Deduplication On/Off; and Compression On/Off (In-Line or Post-Process). Virtual Machines per Container Up to This is the maximum number of virtual machines per datastore in a vsphere HA cluster, as of ESXi 5.5. Thin Provisioning All Nutanix containers are thin provisioned by default; this is a feature of NDFS. Thin provisioning is a widely accepted technology that has been proven over time by multiple storage vendors, including VMware. As containers are presented by default as NFS datastores to VMware vsphere hosts, all VMs will also be thin provisioned by default. This results in dramatically improved storage capacity utilization without the traditional performance impact. Thick provisioning on a VMDK level is available if required for the limited use cases such as fault tolerance (FT) or highly demanding database and I/O workloads. Thick provisioning can be accomplished by creating Eager Zero Thick VMDKs. Eager Zero Thick VMDKs will automatically guarantee space reservations within NDFS. 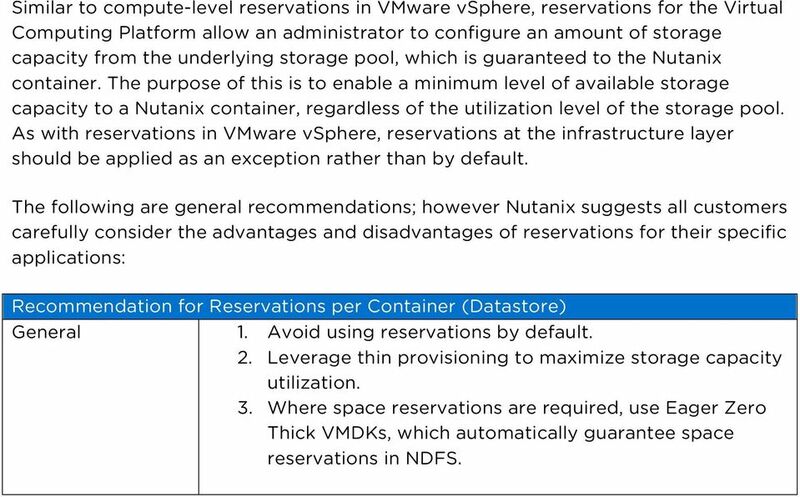 5 Similar to compute-level reservations in VMware vsphere, reservations for the Virtual Computing Platform allow an administrator to configure an amount of storage capacity from the underlying storage pool, which is guaranteed to the Nutanix container. The purpose of this is to enable a minimum level of available storage capacity to a Nutanix container, regardless of the utilization level of the storage pool. As with reservations in VMware vsphere, reservations at the infrastructure layer should be applied as an exception rather than by default. 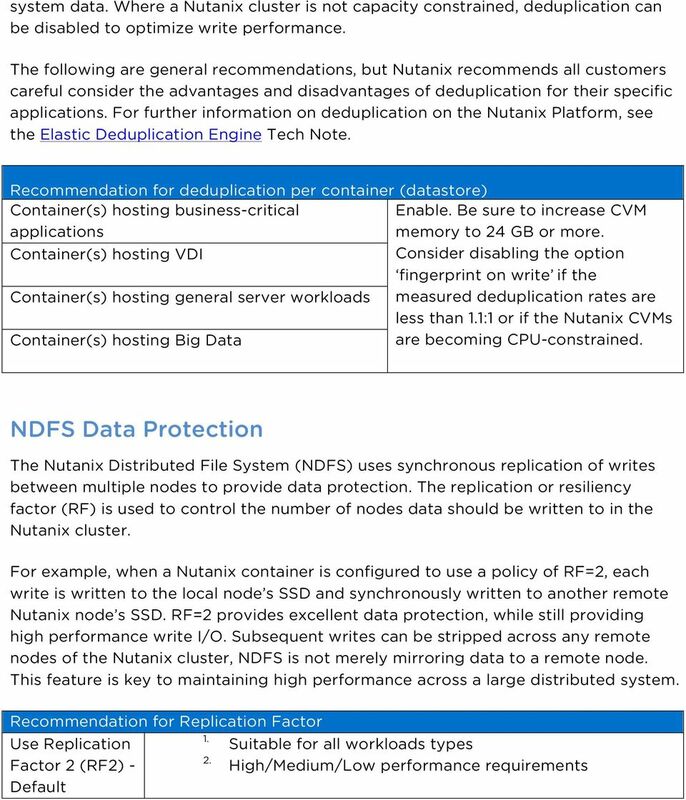 The following are general recommendations; however Nutanix suggests all customers carefully consider the advantages and disadvantages of reservations for their specific applications: Recommendation for Reservations per Container (Datastore) General 1. Avoid using reservations by default. 2. Leverage thin provisioning to maximize storage capacity utilization. 3. Where space reservations are required, use Eager Zero Thick VMDKs, which automatically guarantee space reservations in NDFS. White Paper EMC VNXe3200 UFS64 FILE SYSTEM A DETAILED REVIEW Abstract This white paper explains the UFS64 File System architecture, functionality, and features available in the EMC VNXe3200 storage system. VMware. 2014 VMware Inc. All rights reserved.